Organizers of the Olympic Heritage Celebration need a miracle. Their 2014 games are in jeopardy unless it snows hard and fast. “Two years ago, we had no snow,” said Heidi Doyle, executive director of the Sierra State Parks Foundation, one of the program sponsors. “The night after the Eagle Wings danced, I believe after all that positive energy, we got unpredicted snow,” she said in a news release. Doyle hopes that the Eagle Wings Dancers can perform a miracle this year, as there’s been sparser than usual snowfall in and around Tahoe, California. Doyle in a press release. Doyle was referring to the year that Squaw Valley, California was chosen to host the Winter Olympic Games. In 1960, the organizers, including Walt Disney, were nervous because the world was about to watch the games in a place that was having an unusually dry winter season. There was barely any snowfall. Disney, who was chairman of the Pageantry Committee, planned the opening ceremony. He brought in tribal dancers to coax the snow to fall, and after the snow dance was performed, the weather changed. More than 12 feet of snow fell and the games went on as planned. Doyle hopes that the Eagle Wings Dancers can perform a bit of magic for the third time. The Eagle Wings formed in 2006 to keep the Native American song a dance alive. 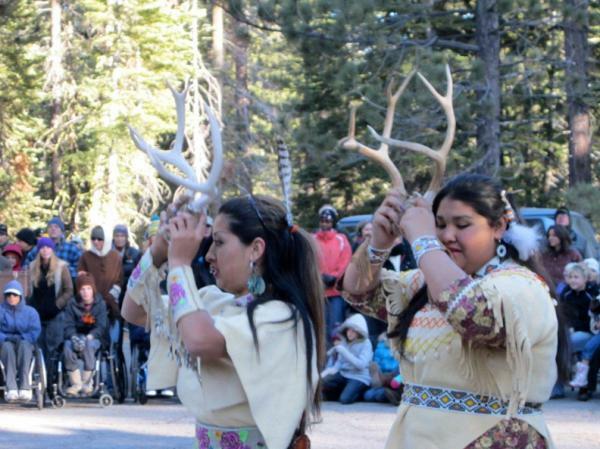 The songs and dances they perform are more than 1,000 years old and indigenous to the Paiute, Shoshone, and Washoe tribes. “Our motto is ‘dancing in the steps of our ancestors,’” said Lois Kane, the director of the dance troupe in a news release. “We believe it is the spirit of the Old Ones that lead and guide us.” The Eagle Wing Dancers will perform in the opening ceremonies and dance in front of the iconic Tower of Nations at the park entrance of the park. The opening ceremonies of the Olympic Heritage Celebration begin on January 11 at the Sugar Pine Point State Park in Tacoma, California. It’s a week-long series of skiing and historic commemorations that honor the Olympic games. The programs focus on the North Tahoe Olympic cultural history, as well as recreational events to promote the spirit of fair play and fitness. Former Olympic athletes are also scheduled to attend, including Pete Wilson, a 1960 Bronze medal winner and Joseph William Tyler, who was a member of the 1980 U.S. bobsled team. Dignitaries will be on hand to light the caldron and tour the trails at the state park where the Olympic events took place 64 years ago. “We encourage the community to join us as we honor our Olympic Heritage and dance for snow,” Doyle said. This entry was posted in Sports and tagged agle Wings Dancers, California, games, Olympic Heritage Celebration, Olympic Heritage Games, snow by Kim Kalliber. Bookmark the permalink.